Today, we look at step 1 – the evaluation and improvement of the Plan and benefit design. Employers often miss the opportunity to make superannuation work for them because the plan design and service delivery are not structured in a way that the corporate super plan can be promoted to the workforce as a superior benefit. A superior benefit is one that maximises employees’ superannuation balances and income in retirement in line with their goals. Done well, the employer will be seen as caring for its workforce and hence a well-designed and delivered plan can become a motivational tool, making the cost of super work for the company. The traditional way super is delivered can be reinvented. The modern approach is to improve the design, promote the plan well to the workforce and ensure delivery is performance managed so that the benefit is, and remains, superior for the employees. 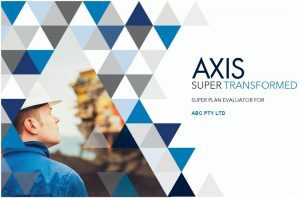 AXIS’ approach is to work with employers to transform their super into a promotable superior benefit by evaluating and improving the plan design, promoting the plan to the workforce and performance measuring service delivery. The modern approach to transforming super into a superior benefit …. The starting point in any change is to evaluate the current situation. No change can happen unless the current circumstances are known by reference to technical data which can be used to review and assess the areas which need to be improved. Super is a complex area and hence AXIS has developed a comprehensive actuarial approved algorithm and process so that meaningful observations can be made on the plan design, workforce penetration and service delivery model. Recommendations on how the super design, promotion and delivery can be improved so that it becomes a promotable superior benefit improvements. Armed with technical data, analysis and comparisons an employer will be in a position to negotiate improvements in the plan design and service delivery with the current provider or should you desire, approach the market for proposals from alternative providers.